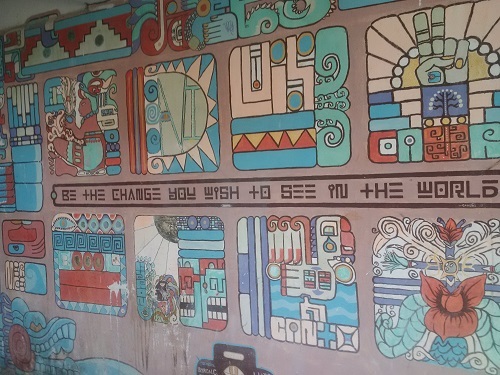 The first thing that strikes you when you step off the boat from Belize City is the change in pace. 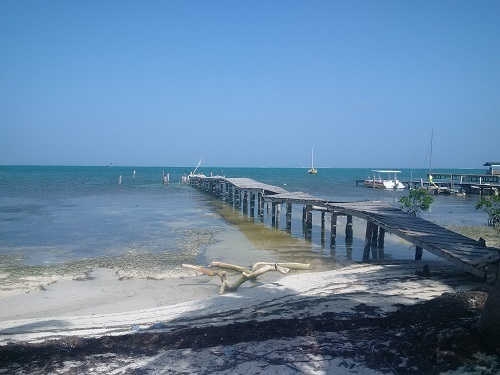 Everything seems to be set to slo-mo in this picturesque island of Caye Caulker, where you can traverse its entire length in 20 minutes and where walking is the most common form of transport, though bikes and golf carts are available too. To be sure, things move a lot slower in the entire country of Belize than it does in North America but the residents are particularly unhurried on this small Caribbean Island. Situated around 20 miles north-northeast of Belize City and one mile west of Belize Barrier Reef – the second largest coral reef system in the world after the Great Barrier Reef in Australia – Caye Caulker boasts approximately 1,300 residents, vital fishing and tourism industries and a cultural mix that includes the predominant Mestizo as well as Garifuna and Creole. 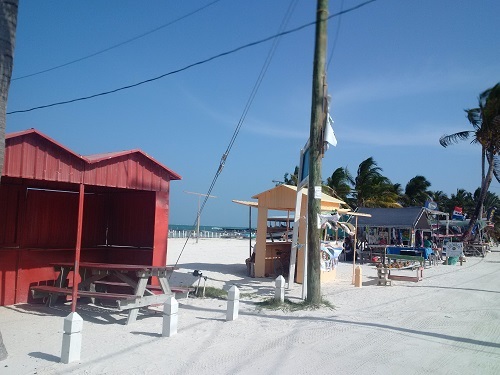 With it being laidback, inexpensive and an ideal destination for snorkelers and scuba divers, Caye Caulker is a haven for those in search of respite and natural beauty. Turns out, it made for a delightful two-day stopover on our National Geographic Journeys with G Adventures tour of Belize (made possible by WestJet’s new direct flights from Toronto). Not surprisingly, many expats come to visit the island and never leave. 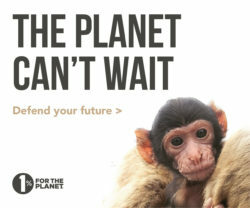 But it’s not just the beauty that keeps them here. Some are pulled by a bigger purpose and the challenges they’re determined to tackle. Just ask Joni Miller, who co-founded the Ocean Academy, the only high school on the island. Prior to her work with the school, Miller was a high-school teacher on Vancouver Island, Canada who frequently visited Caye Caulker. After seeing a real need, she, along with Heidi Curry and Dane Dingerson, started the school, bringing equitable access to education to the village – and a whole lot more. Here’s the thing: only 40 percent of youth in the country attend secondary school. Those on the island don’t really have many choices for schooling after primary education. If they can afford it, they either attend boarding school elsewhere or pay for expensive water taxis back and forth to the mainland. Many choose instead to quit school at the age of 12 and join the workforce, but with youth unemployment at 30 percent that’s not an easy choice either. What’s more, the island faces another challenge- it desperately needs measures to conserve its natural beauty and resources that are currently compromised by the upswing in tourism and coastal development. The Ocean Academy high school launched in 2008 to provide students with a localized education that emphasizes experiential learning in areas most needed on this small island: the conservation of its increasingly threatened wildlife and opportunities in the green economy and ecotourism. Referred to as SEaTiDE, Center for Social Enterprise, Technology, Innovation, and Development, the school’s mission is to develop innovators and changemakers, holding close to its heart the motto, “preserving our heritage, creating our future.” Which would explain its multi-layered focus on coding and robotics classes, marine biology and environmental projects like mangrove restoration and composting – as well as the running of various social enterprises. The school runs unique social enterprises that allows students to take on the role of tour guide for visitors while engaging in activities like kayaking, fly fishing or biking around the island. The opportunities – such as Bike with Purpose – lets students earn fees to pay for tuition, books and other scholastic needs while gaining real-word job skills. The hope is that these hands-on and practical educational opportunities (in addition to the traditional curriculum) will encourage a passion for education and entrepreneurialism and reduce the unemployment rate. “We want to inspire them to make money from their passion,” says Curry who adds they’ve also started culinary arts courses. The school and their focus on social entrepreneurial initiatives are opportunities of a lifetime for many, says Ariza McFarlane, our remarkable student guide on our Bike with Purpose tour. That the education is not free in Belize means students struggle to pay for it, their uniforms and books. It’s a real barrier that keeps kids out of high school, affirms McFarlane, adding half of the revenue from these tours go back into programming while another half is given to students. 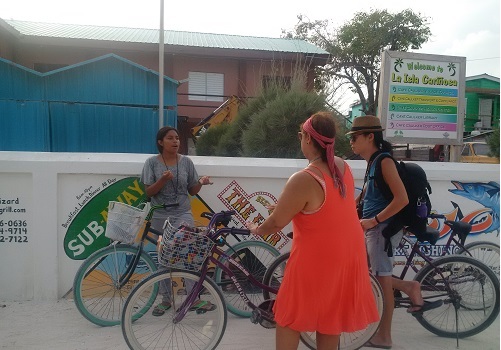 Throughout our educational tour of the island, 18-year-old McFarlane was engaging, informative and clearly inspired by her social entrepreneurial turn as our guide, pointing out a number of culturally and environmentally relevant spots in her adopted home of Caya Caulker. She relates how a difficult personal journey – including watching her brother suffer from an illness with limited medical facilities in her village – led her to Belize and a passion to making a difference. With the encouragement of her uncle and aunt, with whom she now lives, and the staff at the Academy (in particular, the science teacher of whom she speaks fondly), McFarlane is a top student and hopes to continue her education in the medical field. She credits a vital government subsidy, along with Bike with Purpose for giving her the financial support she needs along the way. “It really helps me because half of it goes to fees and the rest are for pocket money,” she says of the tours. Of course, the project wouldn’t be possible without the support of others too, like G Adventures’ Planeterra Foundation, who raised funds to provide much-needed bicycles and other materials so the Ocean Academy can run these student-led bicycle tours which sees 2500 travelers each year. And let’s not forget the importance of connecting the school to such a vital market for tourists. 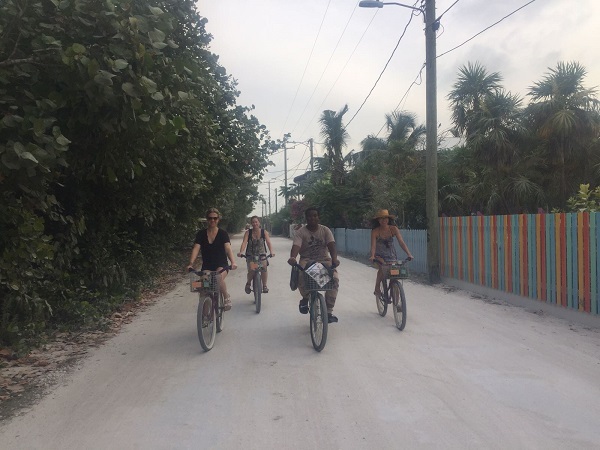 Many of the G Adventure trips to Belize include Bike with Purpose tours, while bike rentals are available for all travelers, with proceeds funding educational programs at the Academy. With a current roster of 82 students – up from 33 when they started – the founders of Ocean Academy are hopeful about its future. Today they depend on the government for 40 percent of their funding, while 10 percent comes from school fees, seven percent or so from their social enterprises and the remainder a result of fundraising efforts. Elisa Birnbaum is the publisher and editor of SEE Change Magazine and the host of its podcast, In the Business of Change. Thanks for this wonderful summary of Bike with Purpose and Ocean Academy! Isn’t it a wonderful place? Thanks Kelly, yes it was a lovely place, loved it!